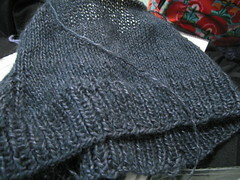 Needles: 9 / 10.5 Clover bamboo circular. This sweater is temporarily on hold while I finish the scarf, and since it’s a spring sweater (having no sleeves…though it has a turtleneck), it’s fine. Artfibers is a very Bay Area, and since I grew up there, I can make that comment. All of their yarns have vaguely ethnic names, and it has a somewhat strident hipster San Francisco vibe. But I do think this yarn feels nice, at least while knitting, and the free pattern deal is useful for a beginner knitter like me. What I have learned so far is…really, don’t twist your stitches when you link them together, otherwise you will end up with a mobeius strip like me, and then have to rip them all up.